1. To be able to think for yourself. In college you are constantly taught, over and over again, how to think in order to get a better grade. Most of the time, though, the thinking that result in a better grade is not the same as the thinking that actually solves a problem. We have all encountered this at least once and had to deal with the overwhelming frustration of knowing that our solution to a problem WAS correct (just to be told that it wasn’t). With a constant schedule of classes that are by no means structured in any sensible time increments, it becomes harder and harder to stay productive. Because of the odd timing between classes you can’t focus on getting meaningful work done as your head is being torn between what will be going on in your next class and what may be happening later on in the day. The real world is nothing like this. In order to be at your most efficient, you have to be able to sit down and work on one problem for long periods of time without distractions. It’s the only real way to accomplish anything. And if a different problem happens to arise, you need to be able to have the freedom to intelligently change your focus. Something that you just can’t learn when every portion of your day is planned to the minute. 3. To be able to go through a body of work. By spending more time with something you are passionate about you can slowly close the gap between the work that you want to produce and the work that you are currently producing. However this is not possible when, as stated previously, your attention is being pulled in a multitude of meaningless directions. 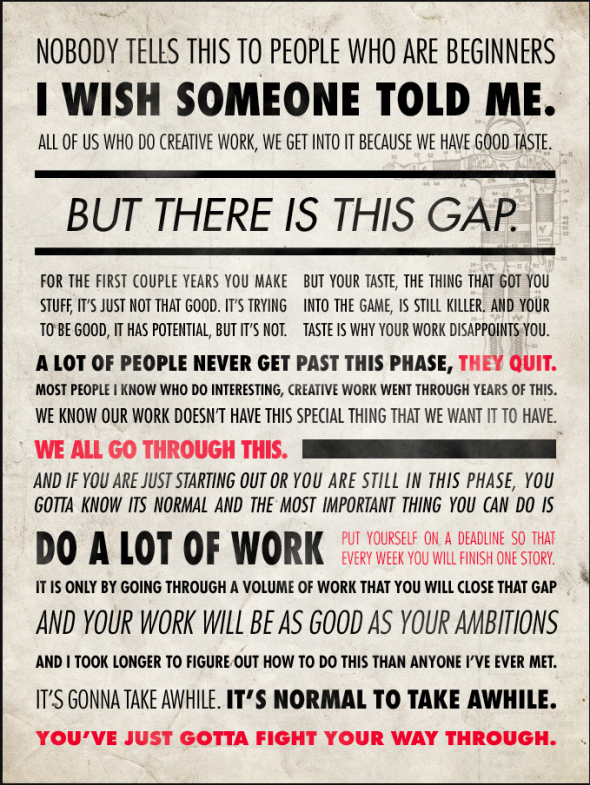 I’ll leave it up to Ira Glass to get this point across. As with any activity it is much harder to reverse bad habits than it is to start with good habits right off of the bat. With the ever-changing technological landscape we no longer need to rely on a college degree to be able to prove our worth in society. The more innovators we see come and go the more we can see that it is in our own unique thinking that helps to raise our human capitol, not in the broken systems of the past. So if you have ever used your lack of a college degree as an excuse to put your dreams on hold, you can stop that thinking right now. Look at it this way. If you were to quit your terrible job right this second and go after something that actually mattered, what would you do to get by? The answer isn’t relying on your college degree.